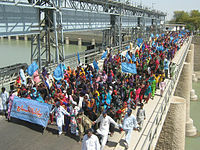 The Indus River Delta (Urdu: سندھ ڈیلٹا‎, Sindhi: سنڌو ٽِڪور‎), forms where the Indus River flows into the Arabian Sea, mostly in the Southern Sindh province of Pakistan with a small portion in the Kutch Region of the Western tip of India. The delta covers an area of about 41,440 km² (16,000 square miles), and is approximately 210 km (130 mi) across where it meets the sea. The active part of the delta is 6,000 km2 in area (2,300 sq mi). The climate is arid, the region only receives between 25 and 50 centimetres (9.8 and 19.7 in) of rainfall in a normal year. The delta is home to the largest arid mangrove forests in the world, as well as many birds, fish and the Indus Dolphin. During the Abbasids, the caliphate began to disintegrate, and the delta came under the control of the increasingly autonomous province centered at Mansura. The eastern part of the delta was even more independent and controlled by the Sumra tribe until 1053 AD, when the region was brought under the control of the Khalji Delhi Sultanate by Alauddin Khalji. The tribe had several capitals, but none are populated today. In 1333 AD, the Samma Dynasty ruled all of the delta, and established their capital first at Samu-i (on the south bank of Keenjhar Lake) and later at Thatta. It was during this dynasty that the "golden age of native rule" (1461-1509 AD) happened in the delta and Sindh, under the rule of Jam Nizamuddin II. The end estimated coastline of the Indus delta with the Arabian Sea (the maximum length in the direction of the coast) is approximated at 210 km (130 mi), 220 km, and 240 km (150 mi). Because the Indus river has switched its location at various points in history, it has an "active" delta region, and total delta region (all area that was once a part of the delta). The total area is estimated at 29,524 km2 (11,399 sq mi), 30,000 km2 (12,000 sq mi) and 41,440 km2 (16,000 sq mi). The active area is estimated at 4,762 km2 (1,839 sq mi), and 6,000 km2 (2,300 sq mi). 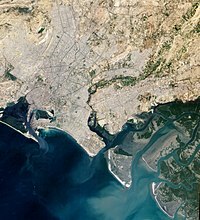 The length of the total delta along the axis of Indus is estimated at 240 km (150 mi), whereas the current delta stretches from the Arabian Sea to just south of Thatta (~100 km or 62 mi). There are currently 17 major creeks(Including Sir Creek, Bhitiaro Creek and Kori Creek) and numerous minor creeks. Indus delta has shrunk by 92% since 1833. In light of the threats, Indus Delta was designated a Ramsar site on November 5, 2002. The WWF is working on conservation methods to alleviate the Indus delta's shortage of freshwater. ^ "Indus Delta". Ramsar Sites Information Service. Retrieved 25 April 2018. ^ a b Peter J. Hogarth (2007). The biology of mangroves and seagrasses. Oxford University Press. p. 222. ^ a b c Walsh, Declan (2010-10-21). "Pakistan floods: The Indus delta". The Guardian. ^ a b c Walsh, Declan (2010-10-05). "Pakistan's floodwaters welcomed along Indus delta". The Guardian. ^ a b c d e f g "INDUS DELTA, PAKISTAN: economic costs of reduction in freshwater flow" (PDF). International Union for Conservation of Nature. May 2003. ^ George Pararas-Carayannis. "Alexander The Great - Impact Of The 325 Bc Tsunami In The North Arabian Sea Upon His Fleet". ^ Mahmood Khalid Qamar (2009). "Mangroves of the Active Indus Delta- Changes and their causes". Archived from the original on 2012-04-18. ^ a b c d e f g h Altaf A. Memon (May 14–19, 2005). "Devastation of the Indus River Delta". World Water & Environmental Resources Congress 2005. Anchorage, Alaska: American Society of Civil Engineers. World Wildlife Fund. ^ a b c Coleman, James M.; Huh, Oscar K.; Braud, DeWitte (2008). "Wetland Loss in World Deltas" (PDF). Journal of Coastal Research. 24: 1–14. doi:10.2112/05-0607.1. Archived from the original (PDF) on 2012-04-26. 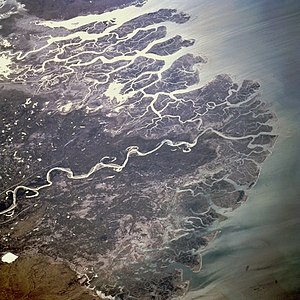 ^ a b c d "Indus River Delta". World Wildlife Fund. Archived from the original on 2012-01-23. ^ Anthony G. Miller; Thomas A. Cope; J. A. Nyberg (1997). Flora of the Arabian Peninsula and Socotra. Edinburgh University Press. p. 253. ^ "Indus Delta facing threats". Dawn. 2003-09-11. ^ "Indus delta has shrunk by 92% since 1833". Retrieved 31 March 2018. ^ Alex Rodriguez (2010-08-28). "1 million displaced by delta floods in Pakistan". Los Angeles Times. ^ a b Zofeen Ebrahim (2010-06-28). "Water Trickles Back into Village, Thanks to Solar Desalination". Inter Press Service. Archived from the original on 2010-12-16. ^ "Mighty Indus has its delta ripped". Pakistan Today. 2011-07-09. ^ Peter Bosshard (2010-06-21). "The Forgotten Downstream Victims of Large Dams". International Rivers. ^ Zofeen Ebrahim (2009-03-16). "Save the Indus Plead Delta Folk". Inter Press Service. Archived from the original on 2009-05-15. ^ "Research and development of Solar Desalination Stills for the communities of the Coastal Areas". Archived from the original on 2012-04-26. ^ Zafar Iqbal Zaidi. "Pakistan-Renewable Energy Report" (PDF). Archived from the original (PDF) on 2012-04-26. ^ Alex Rodriguez (2010-03-09). "Pakistani and Indian fishermen are pawns in governments' disputes". Los Angeles Times.